This convenient value pack comes with all the essentials to meet your business' heavy stapling needs. The desk stapler and premium staples deliver reliably stress-free stapling in busy environments, while the slim remover is easy to keep handy for quick staple removing. 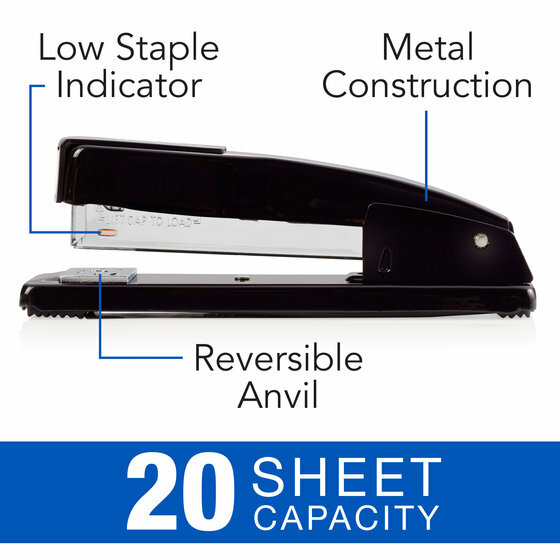 Features a durable metal construction that’s designed for quality stapling from a desktop. Also includes a positive locking latch that makes sure staples are in proper position for use. 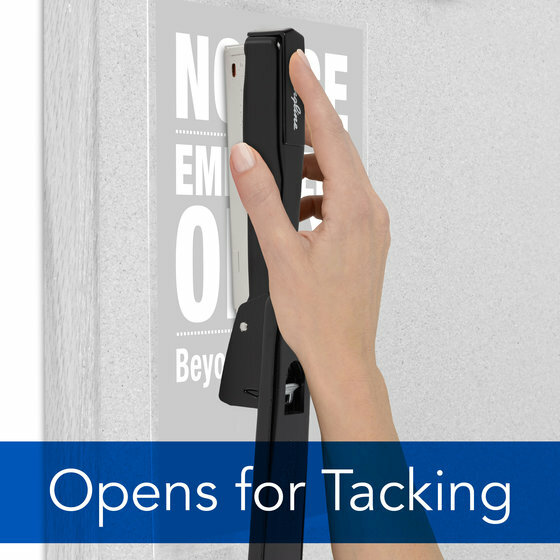 Stapler opens for tacking to post papers to a bulletin board or other vertical surfaces. Anvil also rotates for a pinning function to create temporary staples. Low staple indicator on side of magazine makes it easy to identify when staples run out. Full size stapler holds a full strip of 210 staples. S.F.® 4® Staples have a chisel point to easily pierce through papers, reducing the risk of jams. Standard 1/4" leg length is ideal for most staple jobs. Staples come in strips of 210 to fit perfectly into full size staplers. Includes 5000 staples in a reusable box for neat storage. Retractable blade style Ultimate Staple Remover features a slim, easy to use design for stress-free staple removing. Stapler comes in black and includes a limited lifetime warranty. Remover is black and comes with a limited 1 year warranty. Built for the long term, the Commercial Desk Stapler has what it takes to stand up to serious stapling. This stapler is designed for the desktop and can withstand heavy stapling daily. It’s ideal for busy commercial environments like dry-cleaners, auto shops and administrative offices, but works great in any setting where stapling is in high-demand. You can count on this stapler for superior reliability with each use. 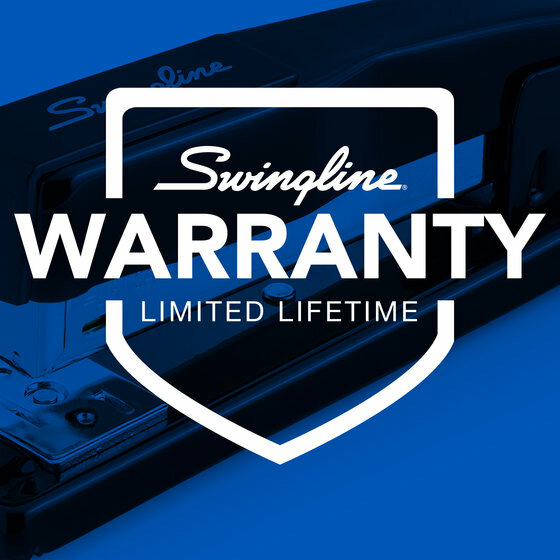 Swingline S.F.4 Premium Staples are designed for use in most full strip staplers--although their performance is anything but standard. 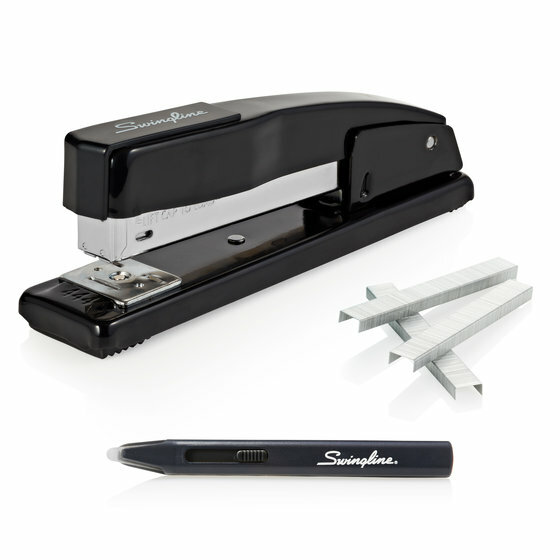 These superior staples ensure confident stapling with every use. Their precision engineered chisel point easily pierces paper to reduce frustrating jams. S.F. 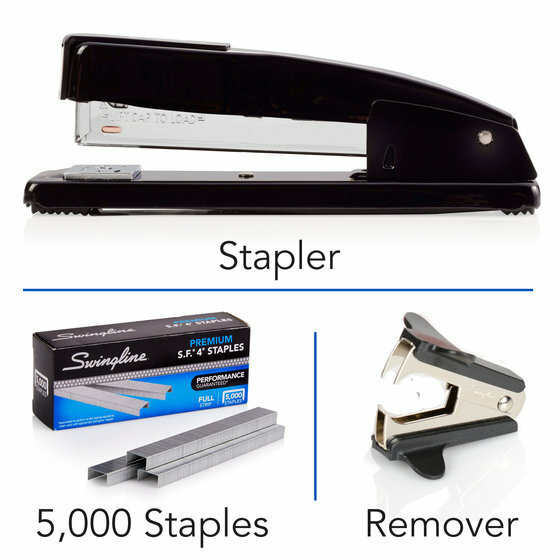 4 staples are the smart, reliable choice for your hardworking commercial stapler. The Ultimate Staple Remover is an essential tool for worry-free stapling. This blade style remover makes removing staples quick and easy. Its slim design and retractable blade allow for simple storage in a desk drawer or pencil case. This handy tool also features a built in magnet that effortlessly picks up discarded staples, so you’ll never find leftover staples on your desk or the floor again.